YELLOWSTONE NATIONAL PARK, WY—In a move that will disappoint campers who delight in seeing the park’s ursine residents in their whimsical matching pajama headgear, nightshirts, and slippers, officials from Yellowstone National Park announced Wednesday that recent budget cuts required eliminating the program that outfits the wilderness area’s hibernating bears with sleeping caps. 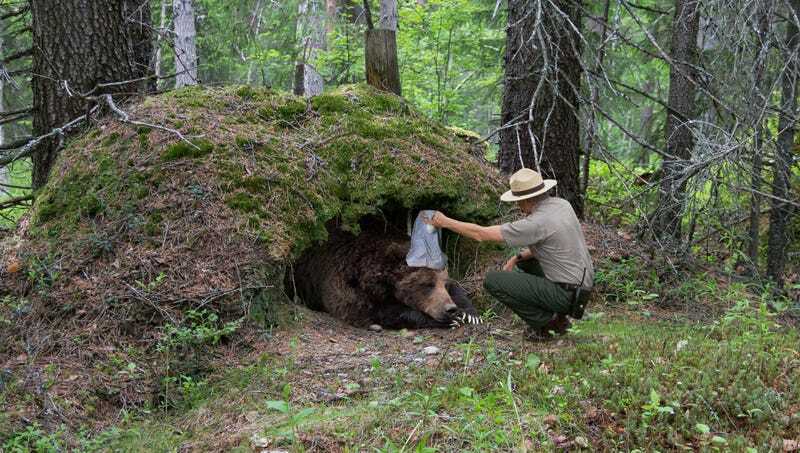 “Due to unfortunate financial constraints, we will not be able to continue providing our drowsy bears with their iconic pom-pom-topped baby-blue nightcaps for their months-long sleep, nor will we be requisitioning more of those little bunk beds the cubs are tucked into,” said Department of the Interior spokesman Rodney Miller, explaining that the Park Service would also no longer supply finger-ring candle holders for the preserve’s grizzlies, brown bears, and black bears to find their way around with when their caves get dark. “We have managed to allocate a small percentage of the budget in the upcoming fiscal year to give heavy-eyed bears their traditional china teacups and saucers, but these animals will have to begin providing their own sleepy-time teas.” Miller, however, noted that the park was able to retain funding for the spectacles worn by Yellowstone’s owls.